Dr. Howard Zucker of Cliffside Park recently returned from a week in Haiti, where he used his skills as anesthesiologist and pediatrician to bring sorely needed services to earthquake victims. “It’s very sad,” he said. “It’s amazing how one event could impact every single person you cross paths with.” The Jan. 12 earthquake was estimated to have killed over 200,000, injured hundreds of thousands of others, and left a million people homeless. The magnitude 7 quake destroyed or hopelessly damaged hundreds of thousands of residences and commercial buildings. Zucker, who has M.D., J.D. and L.L.M. degrees, has a rÃ©sumÃ© that could describe the accomplishments of several busy professionals. Graduating high school at 15, college at 19, and George Washington University Medical School at age 22, Zucker has worked at Yale University School of Medicine, MIT, and the National Institutes of Health, and ran the pediatric intensive care unit at Columbia University College of Physicians and Surgeons. He served in the U.S. government under Secretary of Health and Human Services Tommy Thompson and worked for the World Health Organization, in charge of health technology and pharmaceuticals. Last spring he led a study group on global health diplomacy at Harvard Kennedy School. He is currently senior advisor in the Division of Global Health and Human Rights at Massachusetts General Hospital. He has combined his medical and legal training to develop and improve health policy and the quality of health care in the U.S. and worldwide. During his week of volunteering in Haiti, Zucker spent most of his time at Sacre Coeur Hospital in Milot, about 70 miles north of Port-au-Prince, where many victims had been airlifted. The 73-bed facility became one of the busiest hospitals in Haiti after the quake because it did not sustain damage, and also had a system in place for rehabilitation and recovery of patients. The crisis in Haiti involves “individuals whose lives are completely upside down. Their lives are still upside down,” said Zucker. 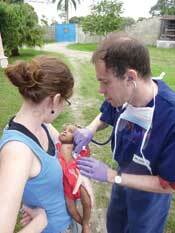 Even before the earthquake Haiti’s millions of impoverished people did not have access to modern medical services. The doctor described some of the cases he faced. “There was a child with marked hydrocephaly – water on the brain. In the U.S. they would have put a shunt in long, long before the child was [in] as bad [shape]. We had a discussion about what to do.” When hydrocephaly is treated early in infants, most babies will recover with no long-term damage. But the Haitian child had no access to treatment and had already suffered serious brain damage. “This was an ethical discussion that would never occur in the U.S. The decision was to send the kid to an orphanage and not do anything medically,” said Zucker. If they had intervened at that point there were no mechanisms to follow up on the severely disabled child. “The poverty in the community – how do you fix all that? We did surgeries and procedures and you try to do what you can. But they need follow up.” He explained that as teams of medical volunteers left they passed the patients on to the next group of volunteers and hoped for the best. Zucker’s tremendous record of achievement includes working on crises such as the anthrax attacks in the United States and developing the “Afghan Family Health Book” to improve public health literacy for millions of Afghanis. Bergen County was among the first 10 program sites. Some examples of the joint projects include addressing diabetes and obesity in children and combating smoking in junior high school students.